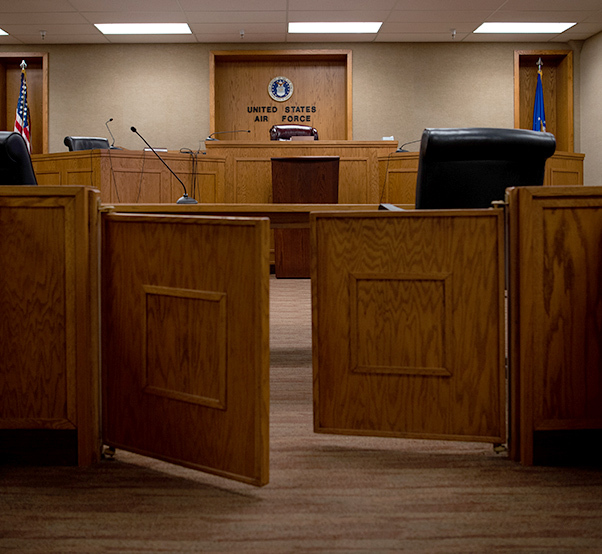 The court room of the 56th Fighter Wing Staff Judge Advocate office awaits its next trial, Oct. 11, 2018, at Luke Air Force Base, Ariz. Court-martials are public hearings that Airmen can sit in and observe as long as it is not deemed a closed hearing. The 56th Fighter Wing Staff Judge Advocate office at Luke Air Force Base, Ariz., plays a vital role in the 56th FW vision, to build the future of airpower. JA is the legal force for Luke in military justice and civil law. JA has a unique working environment that allows officers and enlisted personnel work side by side. 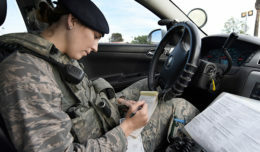 Military justice is an important aspect of all military affairs to make sure troops are upholding the laws stated in the Uniform Code of Military Justice. The Air Force not only has to follow the UCMJ but also must comply with civil law. 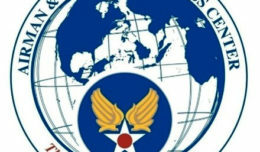 Civil law includes matters regarding administration and operations within the Air Force. Capt. 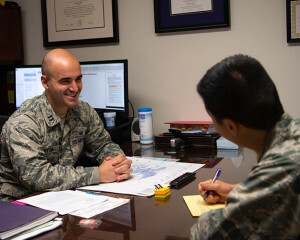 Nicholas Aliotta, 56th Fighter Wing Staff Judge Advocate office, chief of legal assistance, consults with 1st Lt. Edward Kang, 56th FW JA, chief of administrative law, Oct. 11, 2018, at Luke Air Force Base, Ariz. The JA office offers an array of services to active duty, retirees and dependents such as wills, deployments, divorce, etc. Luke AFB has its own unique challenges in the JA office. JA also offers legal counseling from the attorneys that are available. Attorneys can provide counsel on but are not limited to; marriage, divorce, adoption, insurance, wills, etc. If JA is unable to help they will provide advice on where to go or the best way to move forward. JA is open to appointments and walk-ins. Walk-in hours are 9-11 a.m. on Tuesdays, and 2-3 p.m. on Thursdays. For more information or to schedule an appointment call 623-856-6901.